Chinese investors are in talks to demolish Chamber of Commerce House and redevelop the landmark Edgbaston site in another potential property coup for the Far East superpower. Unnamed developers, backed by Chinese investment funds, are in detailed negotiations with the city business organisation over the future of the chamber’s home of 50 years. If a deal is struck, the favoured option is demolition of the office block, which was designed by renowned city architect John Madin and completed in 1960. “We are still keen to redevelop the site and we are in discussions with a potential developer and some Far East investors – it is Chinese money. “The discussions we are having at the moment are the most sustained since the start of the recession. We would have to decamp at the point where the deal is done. “It is a question of whether we come back, and we are minded to stay. We do not think that a city centre location is quite right for us. The plans come amid a rising tide of Chinese-funded property investment in Birmingham. Quayside Tower on Broad Street became the first city building to be bought by investors from the Far East in November 2013. Since then, there has been a string of deals, with Chinese investors developing 130 Colmore Row, soon to be a Nosh & Quaff restaurant, and Franklin House, a former Cadbury factory set to become apartments. The Post has reported in recent weeks how Chinese billionaires have taken an interest in funding major regeneration schemes like Curzon Street and Icknield Port Loop. The chamber has seen its workforce more than halved since 2007, largely due to the loss of Business Link, which has substantially hit its revenue streams from around £36 million to today’s figure of £6.5 million. Its workforce of around 70, down from 200 previously, is now considered too small for the size of Chamber of Commerce House. If the Chinese project goes ahead, the chamber will effectively resurrect an 11-year-old scheme dating back to March 2004. Plans were unveiled to demolish the building and construct a new £90 million headquarters. But the scheme, to provide three new main buildings on the corner of Harborne Road and Highfield Road, was mothballed after the economic downturn hit. 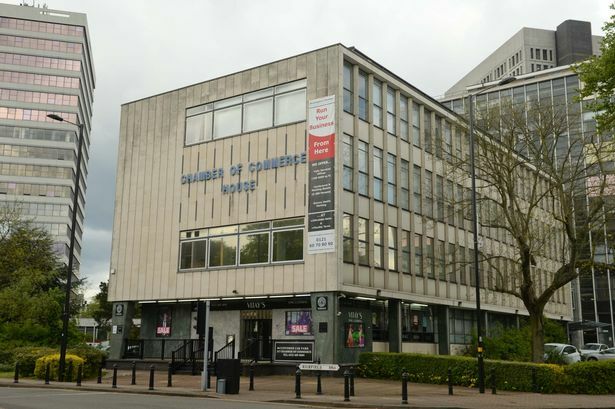 The chamber, which has been in consultation with its landlord Calthorpe Estates over the future of the building, already has planning permission for a knock-down and rebuild scheme. If Chamber of Commerce House is demolished, it would become the latest in a growing list of Madin buildings to be razed in Birmingham. Most famously, demolition has now started on Central Library in Chamberlain Square and is due to be completed before the end of this year. Other Madin buildings to have been knocked down include the former home of the Birmingham Post & Mail, Pebble Mill Studios in Edgbaston and the AEU building in Holloway Circus, replaced with the Radisson Blu hotel. Meanwhile, 103 Colmore Row, better known as NatWest Tower, is also expected to be gone during 2016 and replaced with a brand new, 26-storey office tower.